When it’s 40 weeks + into your pregnancy and you need to relax, overdue reflexology is the treatment for you. Certain acupressure points can be pressed, stimulated or held, to encourage the downward flow of energy and prepare the body for labour. Deep relaxation techniques are included which massage the reflex areas of the hips and pelvis, encouraging Mum to relax and allow nature to take over. Reflexology at this time is so beneficial for Mum-to-be as it allows her the space to let go of all the build up towards the birth, and any tension around the thought of birth can be eased away as the relaxation takes over. 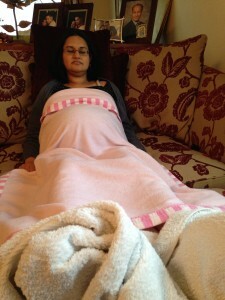 Usually Mums-to-be feel incredibly relaxed after a treatment, however it can also give them more energy. It totally depends on the Mum and the baby, and there can obviously be no guarantees here, especially if baby needs these last few days to get ready. Click here to read a wonderful article about this special time at the end of pregnancy before labour begins. Receiving a treatment can allow Mum-to-be to remain calm and open to remaining pregnant until the right time. Learning to trust the body and relax may be all the signal baby needs to get themselves ready to be born. Treatments can be combined with Optimum Positioning techniques and active rebozo techniques if requested, for an ultimate pre-labour session of two hours. No Replies to "Overdue Reflexology"